Pilgrims01263 715779work01603 870304fax Self-cateringPilgrims is a characterful cottage offering comfortable accommodation in the popular destination of North Norfolk. It is ideally placed for exploring the endless beaches of the north coast, the Queen's residence at Sandringham and the local bird and nature reserves. Pilgrims is a characterful cottage offering comfortable accommodation in the popular destination of North Norfolk. It is ideally placed for exploring the endless beaches of the north coast, the Queen's residence at Sandringham and the local bird and nature reserves. 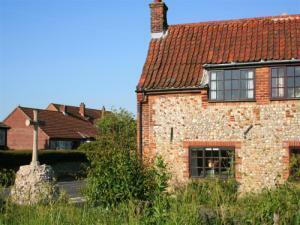 From A148 Situated near an historic cross, close to village centre. From King's Lynn - 12 miles Bus to Hunstanton then taxi.